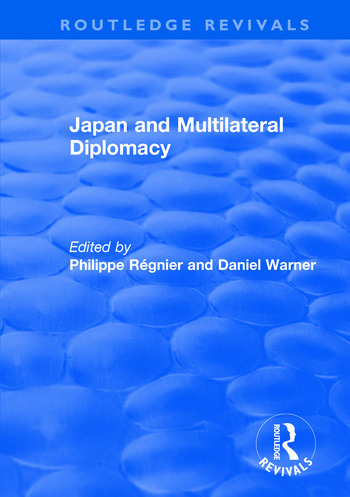 This title was first published in 2001: Japan has a long history of being isolated from multilateral diplomacy. With its increasing economic power, Japan has become more concerned with external foreign relations and hence more involved in multilateral diplomacy. This coherent and interrelated text, brings together studies of the central issues involved, written by prominent Japanese and Western scholars, analyzing the emergence of Japan in multilateral fora from historical, domestic and international perspectives. Those concerned with international relations will find this text an essential guide for courses and research. Contents: Multilateralism: A Theoretical Examination: Possibilities of multilateralism: a regime theory perspective, Yoshinobu Yamamoto; Constructing international order: multilateralism, the United Nations system and international security, Keith Krause;;Opening for omnilateralism: a European view, Wolfgang Pape. Global Security, Economic Order and Multilateralism: Multilateralism and international political economy: the global level, Jean-Pierre Lehmann; Multilateralism and international security: the global level, Francois Heisbourg. Regional Multilateral Arrangements: The Eurasian component of Pan-European security and co-operation: the role of the OSCE in the Caucasus and central Asia, Victor-Yves Ghebali; The regional level: a European perspective, Fred Tanner; Multilateralism and international political economy - the regional level: an American perspective, David Sylvan. Japan and Multilateralism: Japan and multilateralism: the regional level, Tsutomu Kikuchi; Pacifism and the Japanese attitude toward the United Nations, Matake Kamiya; Looking forward - prospects for multilateralism: implications for Japan, Reinhart Drifte; Bibliography; Index.